Are you on the hunt for some delicious & satisfying keto snacks that help keep you on track and knockout hunger when it strikes? If you are like me then you know having snacks can be the difference between staying on the keto diet or not. Snacks are a great way to curb cravings. Having a few good keto snack recipes on hand is super important if you want to be successful on the keto diet. I hope this list has something that you like that you can turn to when hunger strikes. Some of these you can prepare beforehand so you always have something when hunger strikes! The best part about these keto snack recipes is that they are low carb, and guilt free. They’ll still help you reach ketosis, and continue to burn fat. Not to mention they taste delicious! Click on the pink links for the full recipes. 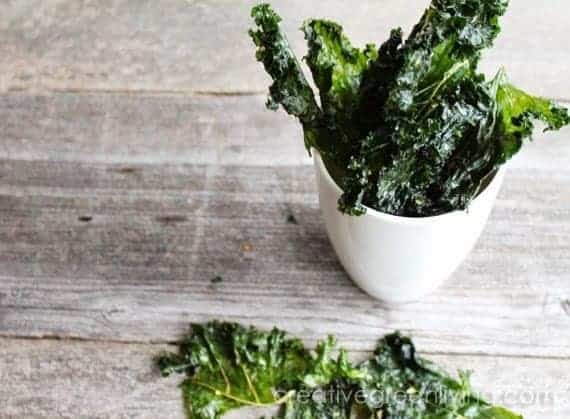 So if its delicious keto snacks you are after, check out these recipes below. Before you went Keto you were probably pretty scared to try to make a soft pretzel at home on your own, but not anymore! 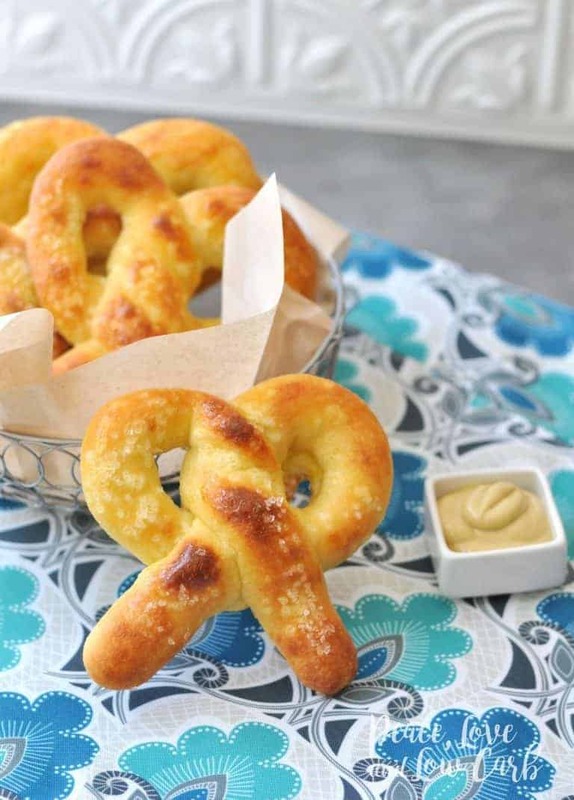 This Keto Soft Pretzel recipe by Peace Love and Low Carbs is easy, truly low carb, and too good for you to pass up! I promise! Now’s the time to stop being afraid to make great food at home by yourself! You CAN do this! Learn how HERE. Don’t roll your eyes! I know what you’re thinking! You’re thinking, “I went Keto because I was trying to avoid eating like a rabbit!” Hey, hey, now! You don’t want to overlook this surprisingly satisfying snack! I make mine in the oven in small batches on a whim, but I’m excited to try my new dehydrator so I can taste this recipe from Creative Green Living. Her “chips” look much bigger than mine. I think the larger size will turn my favorite snack into an obsession… this could be dangerous folks! Hop over to learn how to make these fantastic chips for yourself HERE. Julia at Savory Tooth’s low carb recipes stole my heart this week. Not only did she create a beautiful strawberry cheesecake recipe (above) that will stay within Keto limits, but she also has dozens of other great Keto friendly recipes on her blog! Did you ever think there was such a thing as a Keto Peanut Butter Cup? How about a Keto Chocolate Chip Cookie? Amazing, right? 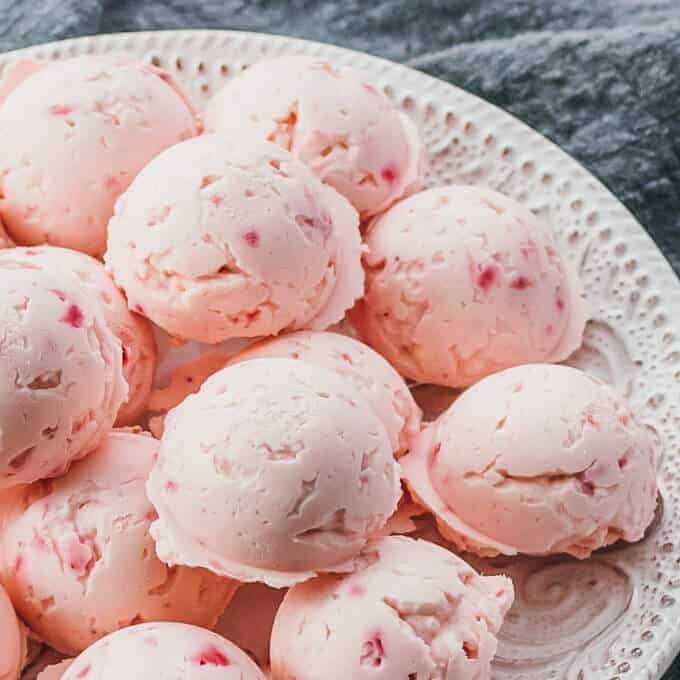 Hurry over to grab this Cheesecake Keto Fat Bombs recipe and many more Keto friendly treats HERE. Are you ready to get snacking? 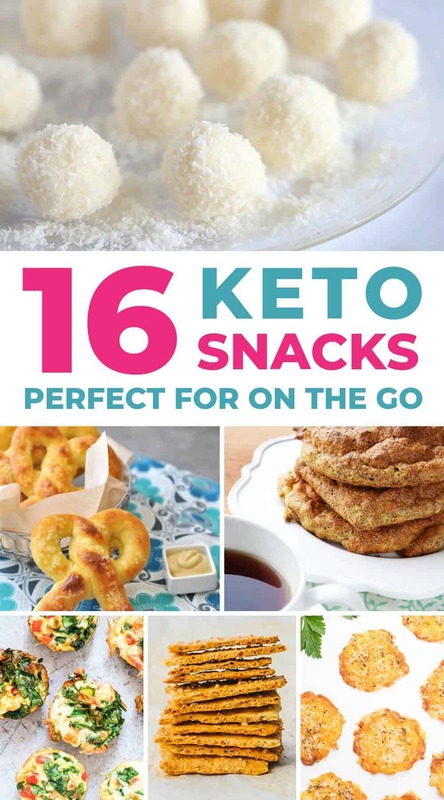 Click on the links to check out the sixteen delicious Keto snack recipes below! Don’t forget to let my friends know you found them at acrazyfamily.com! Love your Instant Pot? Check out these delicious Keto friendly Instant Pot Meals. Looking for an easy soup recipe? Check out these delicious hearty Keto soups. Here is our collection of the most awesome Keto Fat Bombs. I hope you enjoyed this roundup of low carb and keto snacks! If you did, please share them on Pinterest! And if you’re looking for more delicious low carb, keto friendly recipes, please follow our Keto Recipes board!